During the long weekend of Pentecost, we headed towards the South of Denmark, to Møn Island. This small hilly island, located in the Southeast of Zeeland (the island where Copenhagen is situated) hosts one of the most beautiful sites of Denmark: Møns Klint, chalk cliffs. Møn Island also offers a few beautifully painted churches, some megalithic monuments (cairns, among others), and a gorgeous wild nature. Roar! The weather had been fantastic for the whole month of May here in Denmark, and this road-trip on Møn Island gave me a better opinion of the Danish nature, after a typical sad and long winter that makes the flat landscape a little boring. But lastly, spring has shown what it has the best to offer: trees covered by thousands of flowers, so much greenery everywhere, and a fauna that chirps, flits, wriggles, buzzes. Then you just feel like breathing in deeply the fresh and salty air, and licking ice cream cones until you get a sore throat (check!). So we drove down towards Møn Island, a tiny bit of air conditioning in the car and a broad smile on our faces. We made a quick stop mid-way to see the Stevns Klint, less impressive cliffs than Møn’s but nevertheless a witness of the impact of Chixcuclub meteorite (Chi, what?) that happened 66 billion years ago, responsible for the Cretaceous-Tertiary extinction (well, the dinos). A place you could miss but still nice with its old church (Højerup Gamle Kirke) facing the Baltic Sea and the fishing shack nearby. From there, if we drive along the coast towards the South, we take a “green” road all the way down to Møn Island: the landscape is just beautiful. The whole site is huge as it includes more than the cliffs themselves with its widespread beech forest, where it’s so good to hike about (see “Practical information” below). All the area is called Høje Møn (the “upper Møn”). We walked straight down to the beach to face the chalk cliffs, a truly geological curiosity in this flat country. They are 7-kilometer long and are 128 meters at the highest point. When we take a closer look at them, we can see that they are stripped with layers of flint that are constantly falling down as the sea licks them; a delight for fossils collectors however. We had a good time walking along the shingle beach, our shoes squeaking at each step, noticing the on-going erosion of these white cliffs, watching the nuances of the seabed through the crystal clear water from the top of the cliffs, and walking on the smooth soil through the woods overlooking the sea. When we think that it all started 70 million years ago. Denmark was then covered by the ocean, and during millions of years, the limestone shells of the algae living there formed layers of chalk on the bottom of the sea. Later, continents were raised, mountains emerged, and the chalky floor of the ocean was raised above the level of the sea. During the last ice age, around 12 000 years ago, the ice that covered Denmark peeled off flakes of the ancient chalky sea floor, then folded them and squeezed them together until it formed Høje Møn. The flint strips caught between the chalky layers indicate how these layers folded under the great pressure of the ice. When the ice melted down, collapses and landslides that formed the cliffs as it is now followed. On the average, 2 to 4 cm of the cliffs disappear each year, until the complete erosion of Høje Møn that may occur in 50 000 years. You have a bit of time left until then, but still rush there! • Transport towards and on Møn Island: we chose to rent a car through Gomore, a peer-to-peer car rental web site (way cheaper than a traditional car rental company). It takes an hour and a half to drive to Møn Island from Copenhagen. It’s also possible to take public transport – Rejseplanen web site will help you find your way (download the app here) –, but it will then take 3 hours to get there. Once on the island, buses work well, even if it gives less flexibility to go from one spot to the other spread over the island – the cliffs, the churches, megalithic sites, nice little harbours, etc. However, it is do-able! • Accommodations on Møn Island: There are plenty of B&B places, hotels and camping sites, more or less away from Møns Klint. For people who travel by public transport, it may be better to stay close to the cliffs, even if buses are efficient. If you choose the B&B option, I would recommend Fuglehavegård B&B, lost in the countryside near Hårbølle, in the south-west of the island. I first found this lovely place called Købmandsgaarden but it was full. 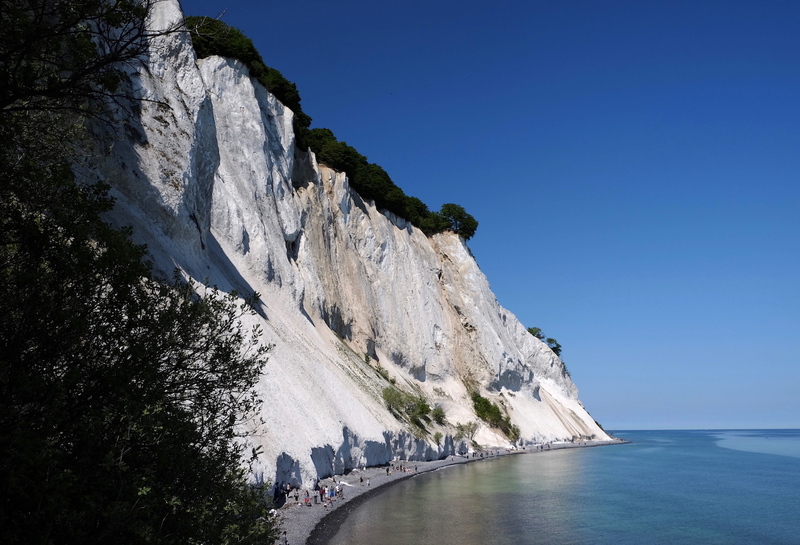 • The Møns Klint: Free access to the cliffs. Better, as always, to arrive early (it seems that they are beautifully lit up in the early morning). It takes two hours to make the whole loop, from the top of the cliffs to the beach, not to forget the stairs to walk up and down. By the way, better to be in a good shape or make a few stop on the way up. It gets a little steep! There are three flights of stairs: one in the south (5), one halfway (4/5) and one in the north (4), which allows to make either one half or the other half, or the full loop. We did the northern half by walking down stairs 4/5 and back up at the 4th, which offers more resting places (hehe…). We found that the cliffs on the southern part, seen from the beach, are nicer (less hidden by the vegetation), if you also choose to go for one half. The view from the top of the northern half is stunning. Here is a useful leaflet containing a map of the site with all the possible hikes, and other information especially on the fauna and flora. • The Geocenter: We haven’t visited it with our 4-month old baby, so we can’t say much about it, but I have read that it’s interesting to know more about the geological history of the site. It also offers lots of activities especially for children. Here is the web site for more info. We can buy entrance tickets online or on site. Bonus: after a nice day at the Møns Klint, go and have diner at Hyttefadet Restaurant (booking highly recommended) in Klintholm Havn, and try out their friske fladfisk (fresh flatfish).